A view of the four tracks of the Wheeling, WV team yard. A B&O E-24 class 2-8-0 is spotting cars on track four. This location is in the upper right corner of the plan posted below. I just wrapped up the installation of some feeder wires on a layout section and I wondered exactly when I began this project. A quick review of the time stamps on the photos I’ve taken reveals an August 31st start date for the first two benchwork sections. My wife and I moved to El Paso on July 3rd, and I posted about surveying the new hobby space on August 3rd. A few weeks of design contemplation and the sawdust began to fly August 31st. And here we are with about 85% of the track installed, buss wires installed on all layout sections, and feeder wires installed on four of the eight sections. 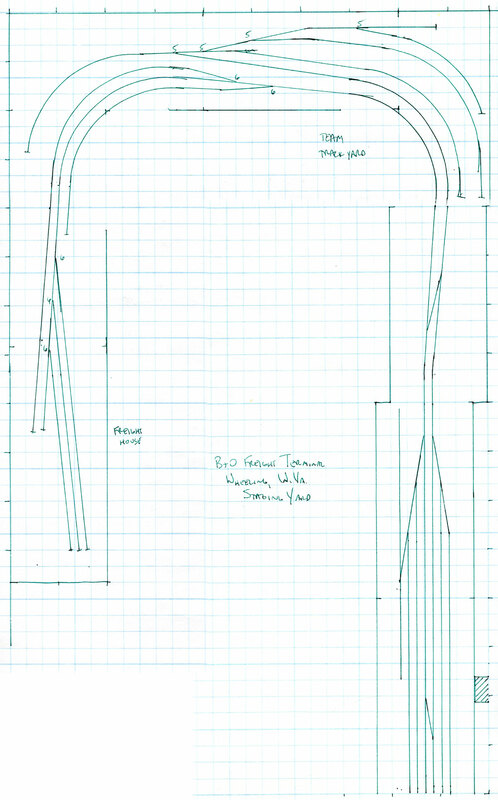 In the plan below, all that remains to install are a few tracks at the freight house on the left leg of the layout. Click on the image to review a larger version. I had a goal to operate by January 1st. A digital command control system is still a few weeks away from installation, so a real session will have to wait. Until then, a nine volt battery provides the power to move a locomotive and a string of cars. I’ve already worked out a few methods to switch seven or eight freight cars in the team track yard and it’s been lots of fun watching the trains glide smoothly along the trackwork. Am I cheating? I’ll leave that up to you, but remember I am pulling and spotting freight cars with a locomotive. The fun I have with a simple nine volt battery encourages more layout progress. Your comments are encouraged. All comments are reviewed and approved before they appear here.